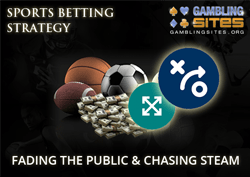 Fading the public and chasing the steam are two sports betting strategies that have been used for many, many years, particularly in the US betting markets. We've covered them both in a single article because they are both centered around the basic principle of making betting decisions based on the opinions and/or actions of others. Both of these strategies are relatively simple, and there are some notable advantages to understanding their main concepts. So we definitely recommend reading through this page and trying to absorb everything we write about. However, we'll point out straight away that these strategies are both relatively limited in terms of finding real value in the betting markets. They are therefore probably not strategies that you'll want to rely on. With that point made, please read on to find out more about these two strategies and theories behind them. The dream of many bettors is to find a simple betting system or strategy that is easy to use and will bring in consistent and guaranteed winnings without the need for much effort. This is a dream of ours as well. The fact is that no such system or strategy exists. There are plenty of systems and strategies that are easy to use and don't require much effort, and it's possible to win money with some of them, but none of them GUARANTEE winnings. Sports betting just isn't that simple. Despite this, there are lots of bettors who cling on to their dream. Some of them even go as far as convincing themselves that certain strategies do give them the easy route to success that they crave. Fading the public is one such strategy. The theory is that by being contrary, and going against public opinion, they will win more often than not. This theory is wrong, but it doesn't stop people using the fading the public strategy. Now, in fairness, there is some degree of logic involved with this strategy. After all, most bettors lose. Therefore, it's not entirely irrational to think that betting against the majority is a viable way to make long term profits. And, in fact, there was a time when this strategy did work. It wasn't all that long ago that the betting markets were effectively determined by the recreational bettors, as it was their wagers which shaped the lines and odds offered by bookmakers. There were many independent sportsbooks in Vegas, and other companies operating offshore and taking telephone bets, and the markets weren't anywhere near as efficient as they are now. The bookmakers were still making profits back then, but it was relatively easy (compared to now at least) for smart bettors to make some money. The odds and lines were often skewed quite heavily towards what the majority of the recreational bettors were betting on, particularly for games involving the most popular teams. For example, you might have seen the following line. Nothing too unusual about this of course. But you would see lines like this when the fair line would actually be something like the following. The bookmakers were basically taking full advantage of the fact that the public (i.e. the majority of recreational bettors) would bet on teams like the Patriots even when the lines weren't even fair. What this meant was that the other sides of such lines were more attractive than they should be. And that's where the smart guys put their money. They were fading the public, and it worked. Fading the public worked to some extent during the early days of online betting too, but things are different now. Betting markets are much more efficient, and the odds makers who work for bookmakers and betting sites are exceptionally good at what they do. The inclination of the public to bet a certain way on certain games is taken into account when setting the odds and lines, along with many other factors. Value still exists in today's betting markets, but you have to be able to do your own handicapping if you want any chance of making consistent profits. You will still find the occasional spot where a bookmaker or betting site has overcompensated for public opinion, and this can result in there being value in going against the public. These spots are fairly rare though, and the days of there being "easy pickings" by fading the public are long gone. The main positive of this strategy is that you're unlikely to blow your entire bankroll if you decide to follow it. There are plenty of bettors who do follow it, which is why there are so many services that sell data regarding what the public is betting on, but we don't recommend that you join them. With that being said, it is always worth considering how public opinion may have affected the lines offered by betting sites. Chasing steam is another strategy that has been around since before the era of online sports betting. Unlike fading the public, though, it has significant merit. It can be a successful strategy if implemented correctly, although we should point out that it's not easy to find the right spots. We should also explain the term steam before we continue with explaining this strategy. In the context of betting, steam is when odds and lines for a specific market start to move rapidly. The theory behind chasing steam is that most steam moves are caused by betting syndicates and/or a few high stake pros getting their money down. The aim is to get your own money down before the whole market has time to adjust. If you see a line move at one betting site that you think is steam, for example, you'd try to place the necessary wager(s) at another site that hadn't yet moved its line. You're basically trying to follow the smart money with your own. This is obviously an entirely logical thing to do. After all, if you could make all the same wagers as the professionals who are making their livings from sports betting then you'd probably be very happy. Of course even when chasing steam, you're not going to be replicating all of their wagers, but at least you have the chance of taking advantage of some of the same opportunities that they've spotted. And that's the big benefit of this strategy. Unfortunately, there are three major challenges with chasing steam. 1You need to be watching the market at the right times to spot steam moves. 2You need to be able to react quicker than the rest of the market. 3You need to have funds in place at a number of different betting sites. These challenges are not insurmountable by any stretch of the imagination. But do you really want to spend hours upon hours monitoring betting markets just in the vague hope that you might spot a steam move? While knowing that, even if you do spot a move, there's every chance that all the other sites will have adjusted their odds and lines accordingly before you have a chance to take advantage? Although there is undoubtedly some value to be had when chasing steam, in our view there is a big question mark over whether it's worth the effort. We wouldn't talk anyone out of following this strategy, but it's not one that we'd wholly recommend either. There are probably better, and more profitable, ways to spend your time.